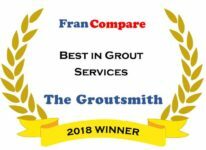 Wondering what makes The Groutsmith stand out in the quickly expanding tile and grout cleaning and restoration industry? Explore the links below to discover how we’ve built a franchise opportunity that stands above the rest to give our partners a business opportunity unlike any other. Looking to enjoy the benefits of a business model built to give franchise partners total flexibility and control over their area? Our home-based business offers low overhead and large exclusive territories so you can start generating profit quickly while assuring your long-term success in the future. Looking for a business opportunity you can be proud to call your own? The home services industry isn’t about reaching out to promote and sell, it’s about offering a professional service to those in need of a solution to their grout and tile restoration needs. With years of experience working in general construction, Jonathan Smith saw an opportunity he couldn’t ignore. Intrigued by the unique work involved with tile and grout repair and restoration, he saw an entire industry going completely ignored by home service professionals who only offered these services as side work. Ready to take the next step toward a Groutsmith franchise of your very own?